Aren't you tired of remembering each emote and typing its name into the chat? With this addon you can search a list of all available emotes and save up to 60 of your favorite emotes spread over 4 tabs. 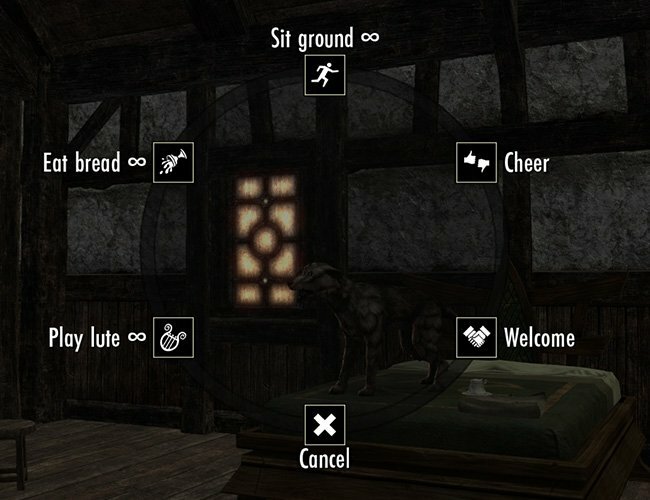 You can play emotes using a list, key bindings, or a radial/wheel menu. I will improve the addon from time to time and add more features. If you have any problems, ideas or other feedback, feel free to let me know. Thanks to all the people who helped me with comments to find bugs and improve my addon. - Highlights emotes that are overridden by a personality. - Display localized names or slash names in the emote list (both in alphabetical order). - Search bar: Search the emote list for a string to find your desired emote faster. - Custom buttons: Define your own buttons that execute chat commands. In the same folder there is also a short manual to help you understand how it works. Always remember to backup this file outside the "AddOns" folder because it will reset with each update. Uses LibAddonMenu. Settings can be changed in the game under "Settings -> Addons -> LovelyEmotes". Modify your key bindings under "Controls -> General -> LovelyEmotes". See the pictures for a better overview of how this addon works. For more information about new features, see the Change Log. - Locked emotes in the emote list are no longer clickable. - Locked emotes are now more visible in the emote list. - The chat string check of the emote synchronization has been reworked and limited to the first two words to avoid possible misbehaviour. - Synchronized emotes via whisper chat have been fixed and should now work as intended. - Custom Buttons: When an empty slot is selected, the input field of the command is automatically focused. - Favorites selection: The display name is now hidden if the display name and the slash name are identical. - Added a fade animation to the selection window. - Chat messages when copying emotes have been replaced by alerts. - Added an alert for successful copy. - Added an alert when a missing favorite emote is triggered by a hotkey. - Implemented a workaround for a concurrency issue with another addon. - Fixed: The number of custom buttons is no longer added to the number of available emotes. - Fixed: Synchronized emotes can no longer be accidentally played through unauthorized chats. * Custom buttons are similar to emote buttons, but they can execute chat commands. * Created custom buttons are shown like emote buttons in the emote list and can be saved as favorites. * Once custom buttons are defined, a new category named "Custom" is created in the emote list. - Added a slash command "/lecustombuttons" to open the custom buttons window. - Added emote synchronization. You can sync emotes via chat with other people who are using LovelyEmotes. - Added a submenu in the settings menu to configure the emote synchronization. - Added key bindings for each tab. - Added key bindings to select the next and previous tab. - You can now also select tabs in the radial/wheel menu using the key bindings. - Added 4 tabs in the main window for your favorite emotes. Each of these tabs contains up to 15 emotes and can be customized in the settings menu. - The saved emotes of previous versions are moved to the first tab. - The radial/wheel menu displays the saved emotes of the currently selected tab. - Key bindings play the emotes of the currently selected tab. - Depending on the settings, the last tab displayed is saved account wide or locally for the character. - Reworked and improved settings menu. - "Character Wide Settings" has been replaced by "Emotes Settings". - "Account Wide Settings" have been renamed to "General Settings". - Added sliders for the new emotes tabs. - Sliders of the emote settings now manage both account wide and local values. - Copying emotes no longer requires reloading the user interface. - Some names and descriptions have been changed. - Added endless loop icon data for: "/gladiatortaunt"
- The default position of the windows on the vertical axis has been changed from 3/4 to 3/5 of the screen height. - Some changes in preparation for the next update. - Fixed the "View All" function in the category dropdown of the emote list. - Emotes that are overridden by a personality are now highlighted. - Changed the default emote category icon of the radial menu. - Fixed: The property "ReplaceName" in the EmoteDataMod.lua file no longer hides unchanged default entries. Note: A new internal command has been added to replace the display names provided by ZeniMax. - The "/eat2" and "/eatbread" emotes are basically the same, but at different speed. The provided English display names were wrong and has been corrected. - Added an option to highlight locked emotes in the emote list (enabled by default). - Added a way to modify emotes yourself. - The random emote function does not try to play locked emotes anymore. - The "Show Endless Loop Icons" option no longer resets the emote list. - Fixed a bug that made it difficult to drag the main window after switching between favorites and emote list. - You can now switch between account-wide (shared) favorites and character-specific favorites without reloading the user interface. - You can now change the number of favorite buttons without reloading the user interface. - Warning icons have been removed from the "Is Using Shared Favorites", "Favorite Emotes Count" and "Shared Favorite Emotes Count" settings. - Added right-click behavior to all buttons. - A right click on an emote in the emote selection window selects the emote without playing it. - Settings that have no effect due to another setting will be deactivated. - Fixed a minimize/expand bug. - Added endless loop icon data for: "/festivalbeggar", "/jugglepumpkin", "/skullponder", "/throweggs", "/throwtreats", "/tracker"
- Fixed: The addon stopped working after the "Is Using Shared Favorites" option was disabled. - Added a new button design which is now the default. - Added an option to change the button design of the favorite emotes in the main window. - Added an option to change the button design in the emote list. - Improved performance of the emote list for a more stable frame rate on weaker computers. - The code of the main window has been reworked. - The position of the emote list has been corrected. - The background of the main window is now less transparent. - The entry to ignore "/testme" is now obsolete and has been removed. - Changed the default value of the "Visibility (Minimized)" setting to 50. - Fixed: Search bar was not working. - Added a button in the main window to switch the list between all emotes or favorites only. - Changed the main window render order to show in front of the default UI. The main window has a lower tier when minimized. - The emote selection menu now also shows the display name of the selected emote. - Fixed: An issue of the emote list build code. - Fixed: Several bugs where the emote list was not correctly reseted. - Added localization support for the settings menu and the key bindings. - Added localized strings for the German language for the settings menu and key bindings. - Added endless loop icon data for: "/glowglobe", "/showtime"
- Some renamings and text changes in the settings menu. - Added an option to show/hide the endless loop icons (enabled by default). - Added an information text in the addon settings menu to show how many emotes are currently available. - Fixed: Redundant emote list initialization. - Added a button in the upper right corner of the main window to lock/unlock the positions of the windows. - Added endless loop icon data for: "/tada", "/happyface", "/sadface"
- Improved code for faster and more efficient emote playback. - Better performance when playing emotes by pressing a key. - Added endless loop icon data for: "/kickthedirt", "/comegetsome", "/iseeyou", "/lineinsand", "/flipthebird"
- Added a slash command "/lerandom" to play a random emote. - Fixed: An issue after changing the alpha value of the minimized main window. - Empty emote categories are now hidden in the emote list window. - Fixed: Executing emotes using keys. - Reduzed the size of the minimized window. - New button for the minimized window. - Windows that can be moved are now highlighted. - New (unique) buttons for save and cancel in the emote list window. - Added a search bar to search in the emote list for a string. Display names of the current language and slash names are considered. - When the emote list is displayed, it no longer resets each time a favorite is selected. - Added a reset button in the bottom right corner of the emote list window. - Fixed: The emote list is no longer sorted over and over again. - The position of the minimized window is now saved separately. Note: Don't worry, your old favorites are still available. All you have to do is turn off the "Is Using Shared Favorites" setting. You can also copy your old favorites to the shared list (see the "Copy Favorites" submenu in the addon settings menu). - Added an option to save favorites account wide (enabled by default). You can disable this option for each character individually if you have characters that need different emotes. - Added a submenu in the addon settings menu to copy favorite emotes from and to your specific or account wide favorite emote list. - The "Toggle Cursor" option is now enabled by default. - A few text changes in the addon settings menu. - Fixed: Radial Quick Menu show/hide bug. NOTE: Because of the changes it is unfortunately necessary to reassign your keys once. - Added a "Radial Quick Menu" for mouse/keyboard users to make emoting more convenient. The radial menu will display all available favorites from the main window. This radial menu works like any standard radial menu in the game, but you have to assign a key first. - Added a key binding for the new Radial Quick Menu. - Added a slash command "/letoggle" to toggle the main window. The idea is that you can switch the invisible main window without having to bind a second key when using the addon as a simple quick menu. - Added a slash command "/lesettings" to open the "AddOn Settings" menu. - Some code changes to avoid possible conflicts with other addons. - Fixed: Rare error message when using a key to execute emotes. - Added an option to display the slash names in alphabetical order instead of the localized names in the emote list (disabled by default). - Added a link to the LovelyEmotes website on ESOUI. - Fixed: Menus are no longer accidentally closed by pressing the "Toggle Main Window" key. - Added a setting to change the visibility of the main window and the emote list. - Fixed: The main window should no longer appear in menus. - Fixed: Duplicates are no longer invisible. - Added an option to automatically minimize the main window when the cursor is hidden (disabled by default). - Added an option to toggle the cursor by pressing the key binding "Toggle Main Window" (disabled by default). - Removed the "Use cursor key" option. - Added setting to set the visibility of the minimized main window. Set the value less than 10 to hide the window instead of minimizing it. - Support for character name changes. - Fixed combat event bug. - Key bindings for favorites: You can assign a key for each selected favorite (up to 15 favorites can be selected). Even hidden favorites can still be played by pressing the set key. - Added a keybind to toggle the main window (again and now forever). - Highlight selected favorites: Whenever the emote list opened, the selected favorite button is highlighted to give you a better overview of which favorite to be replaced. - Added a keybind to toggle the main window (can be found under "Controls -> General -> LovelyEmotes"). - Fixed: Some button textures and sounds. - I added a category box at the top of the emote list to make it easier to find the desired emotes. The categories are updated automatically. Translation by ZeniMax. - Added an option to start minimized (disabled by default). - Minimizes in combat and shows up again when you leave the fight (enabled by default). Has no effect if the window is minimized by the player. This is optional and can be disabled in the menu "AddOn Settings". Hi Phuein, I'm glad you like it. There is already a possibility to hide the window completely. You don't have to change anything. In the game there is a slider in the LovelyEmotes settings menu called "Visibility (Minimized)". If you set this slider to a value less than 10, the window will be deactivated when minimized. Also don't forget to activate the option "Start Minimized". Could you add a checkbox to hide the selection window completely? I installed it just for the keyboard hotkeys to Greet people quickly. And I play in "Immersive" mode heh. As a temporary measure, I changed line 305 of SettingsMenu.lua to let me "hide" it by putting alpha to 0 (instead of min 25), but I'm not sure if that's the best way to do it really. Last edited by Phuein : 04/06/19 at 09:06 PM. Hello lexo1000, that is a good suggestion. I will keep it in mind. A great addition for your addon could be to add the possibility to launch personnalities with shortcuts. It is always boring to have to enter Appearance menu to activate/deactivate them. By the way, it seems there is a bug with Scholar personnality that make all emotes edit by it to appear in double..
emotes that are part of the Scholar personality have been added to the emote list by ZeniMax. These have the same slash and display names as the regular emotes, so this can be a bit confusing. Last edited by ShinyBones : 03/08/19 at 11:48 AM. Last edited by lexo1000 : 03/05/19 at 11:48 AM. Maybe if it's possible you could add the functionnality to play idle animation preset ? Currently I do not see any reason to implement such a feature, because the mentioned addon is actively maintained. However, I implemented a workaround for your specific issue. All you now need to do is to update my addon to the latest version. Have fun. Hello lexo1000, I'm glad you're enjoying my addon. Unfortunately it is not possible to force or prioritize emotes. But if you want to play emotes, you can disable the other addon with a key binding and then enable it again. I'm not using the other addon, but I've seen in the description that there is a key binding for it. Otherwise, the developer of the other addon could add a check (if possible) that no idle animations are started when an emote is already playing. I have no control over that. I hope I could help you anyway. Last edited by lexo1000 : 02/28/19 at 10:44 AM. Hello Aethelwulf, thank you very much for your suggestion. That looks very funny. I immediately added emote synchronization. 1. Navigate to the LovelyEmotes settings menu, find the submenu "Emote Synchronization" and activate the chats LovelyEmotes should listen to. 2. Now you can right-click on emote buttons to write a command into the chat. 3. Press enter and execute a synchronized emote. With Update 4.3, custom buttons have been added to LovelyEmotes. I would like to briefly explain how it works. Custom buttons are very similar to standard emote buttons. They are displayed in the emote list and can be saved as favorites, but execute defined slash commands. To configure your custom buttons, type "/lecustombuttons" into the chat. In the upper left corner of the window you have to select how many slots you want to reserve for your buttons (this is necessary to assign unique ID's and can be changed at any time). The empty slots are automatically displayed in the list on the right side of the window. Now click on one of the slots to select it. In the input field "Command" you can now enter any command like in the chat. Parameters are also supported. Optionally, you can enter a display name. If the display name is left empty, the command will be used as the display name. In the lower right corner there is a check box called "Force Display Name". With this setting you can force the display names (if any) of the buttons if slash names are displayed in the emote list. After you have completed your configuration, simply close the window with the "X" button. The changes are applied automatically (empty slots are not displayed in the emote list). Years ago there was an addon specifically for this though I doubt it's been updated since 2015. Any chance of adding this? Many thanks, by the way, for keeping this going after the defacto departure of earlier such efforts such as ESO Theater. Still works but only had the original emotes. I think quest start sound will fit to, or one used by Dressing Room as build change sound (if it's not the same). As well you can make dropdown in settings and just put into it all sounds in game to choose from. Hi FadrenIndoril, thank you for your suggestion regarding the sounds. I've already started adding sounds. These will not be available in the upcoming update (but soon). I'm not sure if I'll add a drop-down menu for sounds yet. Because there are a lot of sounds and therefore it would be quite messy.